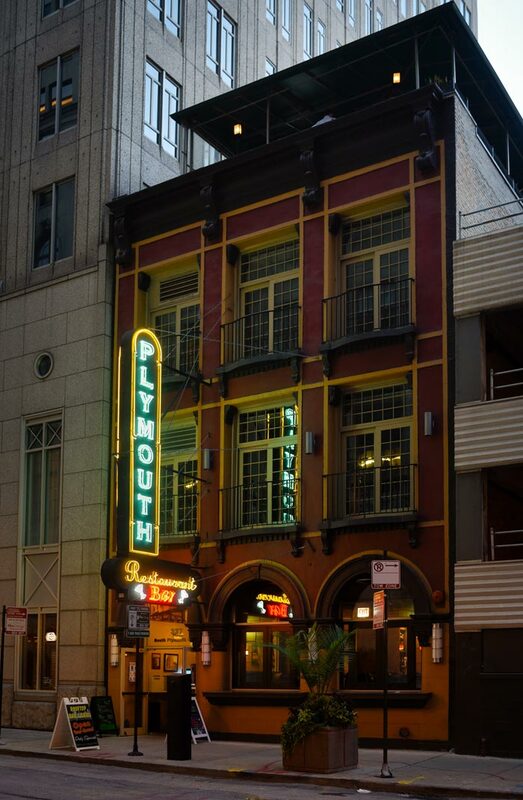 The Liakopoulos and Laskaris Family proudly welcomes you to the Plymouth Restaurant & Bar! The patriarch of our family, Odysseas Liakopoulos, came to Chicago in 1956 from his native Greece. After working as a painter for a year, he opened the Victory Restaurant at 18th and Wabash, with the help of three friends. Together, they went on to found the LaSalle Cafeteria on Wabash and Harrison in 1965. Both of these successful restaurants were later torn down to make way for residential and retail development. The disco year of 1974 brought Odysseas and his partners to Mount Prospect, where they established Kallens Restaurant & Lounge. Odysseas soon brought George, his 13-year-old son, to the new restaurant to bus tables and wash dishes. The industrious young man quickly worked his way up to the position of cook. In 1984, Odysseas decided to leave the suburbs and return to the city. He purchased the former Golden Nugget Restaurant, on the corner of Lincoln and Wellington in the Lakeview neighborhood, and renamed it the Golden Apple. When George graduated from Loyola University four years later with a desire to enter the restaurant industry, Odysseas bought out his partners and brought his son into the family business. His wife, Christina, also became involved, contributing her management and bookkeeping skills. Under this team, the Golden Apple became a success, known throughout Chicago for its quality cuisine and service. The key to this success was the family’s personal commitment. Each day, Odysseas and Christina would work the morning shift, with George covering the night shift. In 1995, George decided the time was right to expand the restaurant business. The family purchased a corner lot at North and Ashland and established the popular Hollywood Grill. On opening night, the restaurant threw wide its doors to lines that stretched around the corner. The Hollywood Grill was soon so successful that the Liakopoulos family sold the Golden Apple in 1998 to devote more time to their new enterprise. George went on to purchase and expand the historic White Palace Grill at Canal and Roosevelt in 2002. Established in 1939, the restaurant is a Chicago landmark, famous for its service, as well as its diverse and faithful clientele. A veritable melting pot of city residents and tourists, the White Palace Grill caters around the clock to politicians and poets, civil servants and cabbies, and a full range of white-and-blue-collar workers, many of whom have been eating there since the 1950s, 1940s or even 1939. In 2005, the Liakopoulos family discovered an opportunity for growth they couldn’t pass up and purchased the old Binyon’s Restaurant at 327 S. Plymouth Court on the first of September. For this venture, Odysseas and Christina, their daughter, Patty, and her husband, Bill, all came aboard to launch the new Plymouth Restaurant & Bar. September 1, 2005, also saw the extention of the family itself, when George’s wife, Lenia, gave birth to a baby girl, named Odyssey in honor of her grandfather. His legacy of hard work and the proud heritage of our family shine through at each of our fine restaurants. So, once again, we’d like to welcome you to the Plymouth Restaurant & Bar. We hope your meal here will be an enjoyable and memorable one!